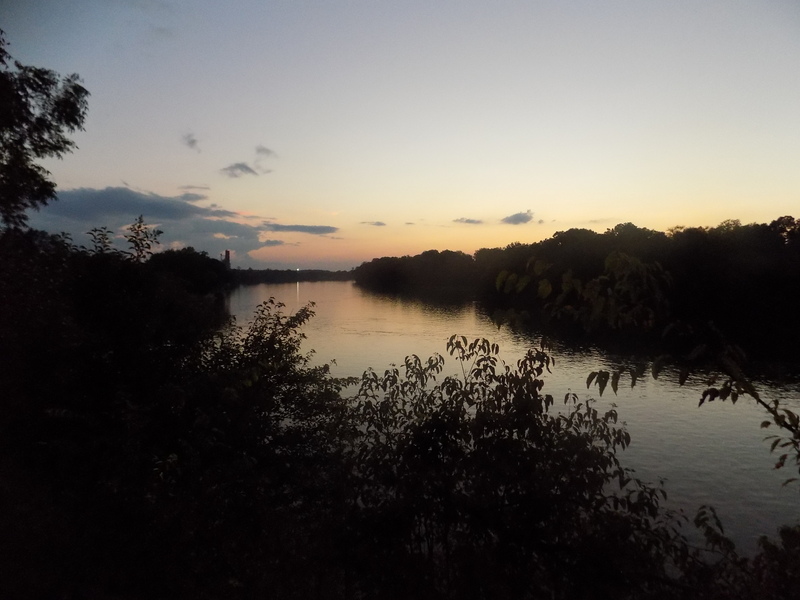 Demopolis, Alabama – the “City of the People” – was founded in 1817 at the confluence of the Tombigbee and Black Warrior rivers by French Bonapartist exiles and other French who had fled the Haitian slave rebellion of 1791-1803. The founding Frenchmen’s original charter was to create a “Vine and Olive Colony,” growing olive trees and grapes for wine-making. They were misinformed that the Canebrake region around what is now Demopolis was suitable for those crops. The vine and olive experiment was short-lived and most of the French settlers moved on to other locations. The few who remained assimilated into the area’s plantation and agricultural economy and Demopolis, despite its shaky beginnings, went on to be a flourishing center of the Black Belt in the nineteenth century. The story of Alabama’s vine and olive colony of French expatriates had “legs” and was reimagined and enhanced, becoming an integral part of Alabama lore and mythology. 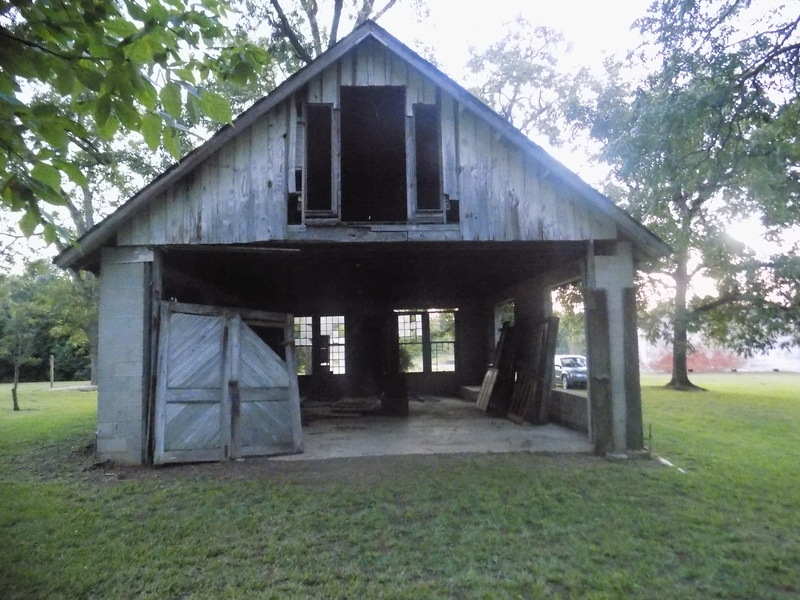 The Vine and Olive Colony of Demopolis has been recounted in numerous ways in fiction and was even a climactic plot point of the John Wayne film, The Fighting Kentuckian (1949). When I first met the artist Julyan Davis (www.julyandavis.com) in the 1980s, he was a recent art school graduate from England who had come to Alabama to learn more about the Vine and Olive colony. He had read about it in books from his novelist father’s library, particularly the fictionalized version found in Carl Carmer’s 1934 “creative non-fiction” novel, Stars Fell on Alabama. Although Julyan is a painter, he is also a skilled writer whose earliest interest in the Vine and Olive Colony was literary; he travelled to Demopolis with plans to write about it and its unique and romanticized history. I met Julyan at a New Year’s Eve party in Tuscaloosa that I attended with one of my good friends, Madeleine, whom Julyan later married. 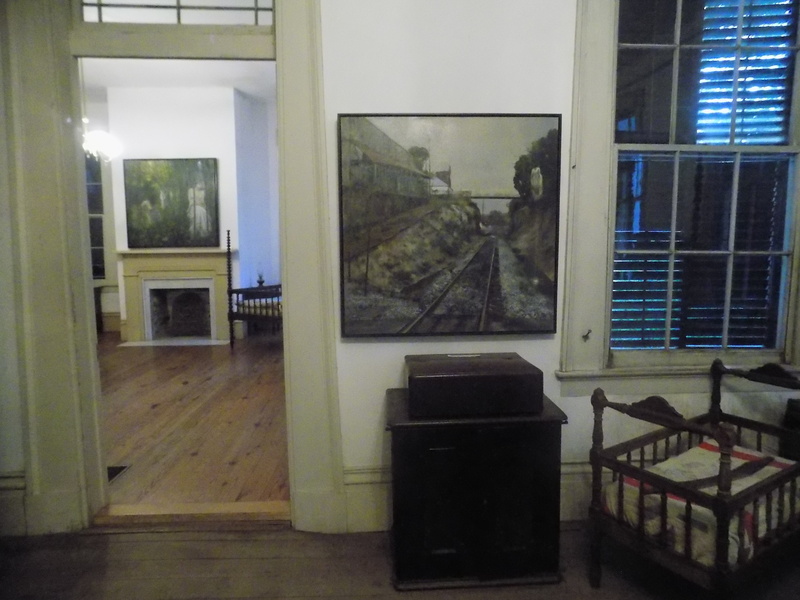 Julyan’s travels are far-flung but he more or less settled in the American South over the past three decades and much of his painting focuses on Southern landscapes, overlooked architecture, and abandoned interiors. As a painter, his interests often complement the interests of photographer and Alabama native William Christenberry, whose life-long work in photography, painting, sculpture, and assemblage chronicles a vanishing and overlooked South and southern landscape. Like Christenberry, Julyan explores the beauty in the decay of the forgotten detritus. He paints proud buildings in disrepair and humble buildings that retain their dignity. He paints cascading Carolina waterfalls in their primitive majesty and Maine seashores in their rustic authenticity. My favorite of his paintings is an early one that I first saw in a gallery in Birmingham. It is a traffic light at a desolate crossroads somewhere in Hale County, Alabama. I haven’t seen that painting in a long time, but I have it memorized, I think, and it’s always just at the edge of my memory. Over the years I stayed in touch with Julyan and followed his art and career as he and Madeleine lived in Birmingham, Atlanta, and Highlands and Asheville, North Carolina. The marriage ended but Julyan and I have stayed in tentative contact over time. Julyan’s literary vent did not ultimately tackle the Vine and Olive Colony but a story-telling sensibility informs his paintings. Perhaps his most heralded project is his on-going “Appalachian Murder Ballads” series of paintings inspired by Appalachian folksongs of Celtic origin. He takes the ancient texts and places them in modern settings – trailer parks, abandoned factories, river beds and railroad trestles, burning buildings. A few years ago, Julyan decided to return to his early infatuation with the Vine and Olive Colony of Demopolis and Marengo County, but as a painter, not a writer. He began a series of “Demopolis” paintings focused on the Symbolist character of Madame Raoul, the Marchioness de Sinabaldi. The moody series of “Demopolis” paintings captures the loneliness of a European expatriate transported to a wild and foreign place. My favorite of the series, “Son premier soin,” shows a lone Madame Raoul from behind, wearing an Empire gown and dragging cane through a canebrake. She holds an axe to her side. It is an evocative painting of stoic solitude. On the occasion of Demopolis’s bicentennial, Julyan Davis took his Demopolis paintings to be displayed in the town that inspires them. 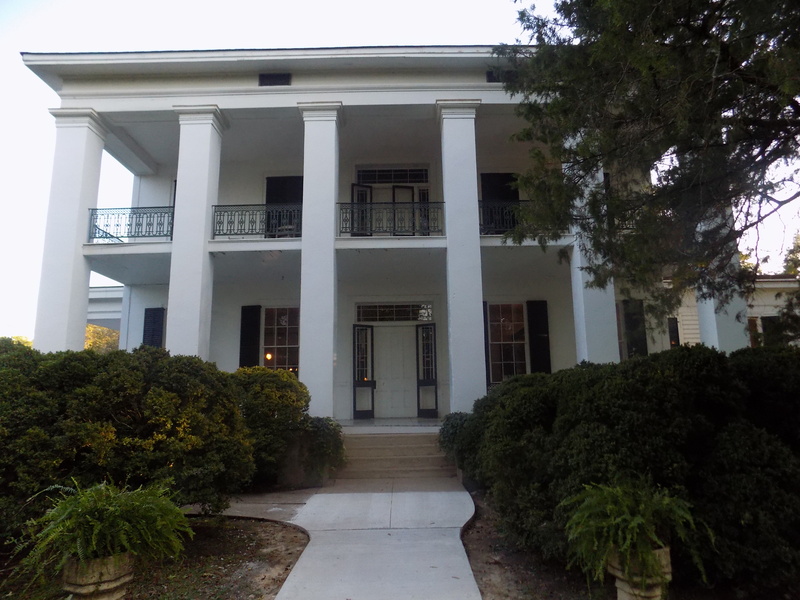 Lyon Hall, an 1853 Greek Revival mansion near the center of town, is a mansion that is maintained but not “restored” and was the ideal site for the exhibition of the “Demopolis” series. Julyan gave a talk about his work and the history of the “Demopolis” paintings on Friday night of the bicentennial event to a packed house in Lyon Hall’s double parlors. 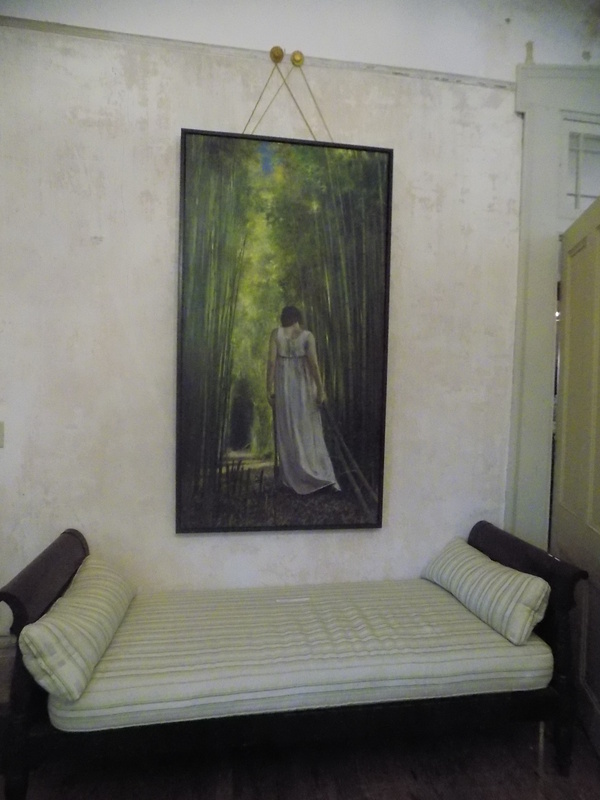 The paintings were hung throughout the mansion’s first floor, providing a moody accent to the expansive rooms of the venerable house. Julyan Davis is a fascinating raconteur with a dry wit who takes pleasure in discussing the impulses that fuel his art. He talked about how bringing these Demopolis paintings to the place that first inspired his Southern sojourn seemed to be a way of bringing his career “full circle.” He talked about why the Southern landscape entrances him. I was only able to be in Demopolis for the opening of the exhibition and for Julyan’s talk but the next day Julyan set up his easel in Lyon Hall and painted in the house while visitors enjoyed the finished paintings and the place itself. As I left Lyon Hall that evening, I walked the grounds, intrigued by the dependencies that surround the house. The rustic charm of these outbuildings competes with the grandeur of the stately main house, where the sounds of the gathering that had assembled for the art filtered out through a peaceful late-summer dusk. This entry was posted in Julyan Davis artist and tagged Alabama, Alabama "Black Belt", Canebrake Alabama, Demopolis Alabama, Demopolis bicentennial, Fighting Kentuckian movie, Julyan Davis, Lyon Hall Demopolis, Stars Fell on Alabama by Carl Carmer, Vine and Olive Colony, William Christenberry on September 20, 2017 by gedwardjourney.